Ahead of Game Seven between the Carolina Hurricanes and Washington Capitals, this year’s finalists for the Mark Messier NHL Leadership Award were announced by NBC Sports, including ’Canes captain and “Mr. Game Seven” himself, Justin Williams. 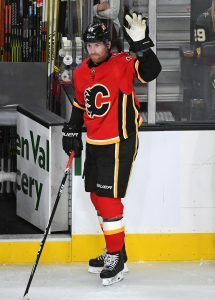 Williams joins Calgary Flames defenseman Mark Giordano and Nashville Predators forward and former Philadelphia Flyers fan favorite Wayne Simmonds as the three players being considered for the honor. An award unlike any other in sports, these finalists are determined by input from fans, team officials, and league executive alike, but the winner is ultimately determined by Mark Messier himself. Messier, considered one of the best leaders in league history, chooses the candidate “who best exemplifies great leadership qualities to his team, on and off the ice”. The list of past winners of the award, dating back to its origins in 2007, include some of the most recognizable leaders in the game, many of whom remain active, such as Sidney Crosby, Zdeno Chara, Jonathan Toews, and Shea Weber. Williams, Giordano, and Simmonds are all great candidates to join their ranks. The Chicago Blackhawks and assistant coach Don Granato have “mutually agreed” to part ways. Granato was hired by Joel Quenneville in 2017, but does not appear to have been a fit for Jeremy Colliton’s staff. The Athletic’s Mark Lazerus writes that Granato specifically worked with younger players as a go-between for Quenneville, but that role was redundant under the younger Colliton. Granato has been coaching since the early 90’s and should be able to find a new gig in no time. In fact, he very likely has an open invitation to return to the University of Wisconsin to coach under brother Tony Granato with a Badgers squad that has their eye on a National Championship next season. Speaking of the college ranks, the University of North Dakota received an intriguing commitment today in the form of a legacy player. 15-year-old Jackson Blake, son of long-time NHLer and former Fighting Sioux standout Jason Blake, announced that he would be following in his father’s footsteps by joining the program – in 2022. Blake currently plays for powerhouse Shattuck St. Mary’s and finished the season in second on the U-15 team in per-game scoring with 24 points in 27 games. As one would imagine about a young teenager, Blake is still small at 5’5″; however if he reaches or exceed’s his dad’s 5’10” frame, Blake should be more than capable of making an impact at the college level down the road. Calgary Flames head coach Bill Peters spoke to the media today as the team finished their year-end locker clean out, and mentioned a couple of players that the team had signed recently. Unfortunately Peters didn’t list them by name, but noted a Russian goaltender—likely Artyom Zagidulin, who was announced a few weeks ago—and a defenseman who is old enough to compete for a spot on the team next season. Elliotte Friedman of Sportsnet tweets that the “mystery defenseman” is likely Alexander Yelesin, who the Flames had been pursuing recently. Yelesin, 23, played this season for Lokomotiv of the KHL and recorded 10 points in 55 games. He had been previously linked (however tenuously) to the Toronto Maple Leafs, and Friedman actually wrote in 2018 that there was an agreement in place to bring him to the NHL. The defenseman’s KHL contract will expire at the end of April, meaning he is free to go wherever he chooses. Though he’s not a big offensive contributor, Yelesin did average more than 17 minutes of ice time for Yaroslavl this season and increased that even further during their short playoff run. The young defenseman is right handed and could offer another depth option for the Flames who face plenty of tough decisions this summer after their early exit from the playoffs. The team currently has a wealth of defenders available to them, but T.J. Brodie, Travis Hamonic and Michael Stone—all options on the right side—are each heading into the final year of their contracts and will be unrestricted free agents in the summer of 2020. The Calgary Flames were handed their golf passes in the playoffs after just five games against the Colorado Avalanche, but it wasn’t for the reasons many speculated on heading into the postseason. For much of the year the team had been dealing with goaltending issues, and when they handed the reins in game one to Mike Smith and his .898 save percentage it was easy to see a way that the top seed in the Western Conference could crumble. Instead, Smith posted a 26-save shutout to open the series and was one of the team’s best players throughout. While he allowed 17 goals across five games, he kept them alive as the team routinely gave up huge shot totals meaning Smith actually finished the playoffs with a .917 save percentage. The 37-year old is scheduled to be an unrestricted free agent this summer, and today was asked at his final media availability whether he’d consider a return to the Flames. 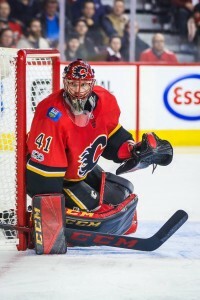 Smith told reporters including Pat Steinberg of Sportsnet that he would “for sure” like to return to Calgary if possible, noting that he loves being part of an organization committed to winning. Looking at Smith’s history in the league, it’s easy to understand why he enjoyed this playoff run even with the unfortunate outcome. The veteran goaltender has only suited up in three playoffs over his long career, reaching it once with the Tampa Bay Lightning in 2011 and once with the then-Phoenix Coyotes in 2012. Incredibly, he has a .938 save percentage over his 24 postseason appearances, thanks mostly to that outstanding run to the Western Conference Final he took the Coyotes on. The question will be whether the Flames have room for Smith on the roster. The team doesn’t have a clear answer to the situation in net, and currently head into the offseason with just Jon Gillies, Tyler Parsons, Nick Schneider and Artyom Zagidulin under contract for next year. David Rittich and Mason McDonald remain under control as restricted free agents, but none of those names seem to make up a tandem worthy of a Stanley Cup contender. There are other big decisions to make this summer including new contracts for Sam Bennett and Matthew Tkachuk, but also where to go with a defense that was carved up by the speedy Avalanche forwards. T.J. Brodie, Travis Hamonic and Michael Stone all have just a single year left on their contracts, while younger options are pushing for more ice time. Smith will likely have to wait until after some of those decisions are made, given that he can’t be the full-time starter again next season if they have plans on advancing further than this year. Even with his surprisingly good performance, something needs to be done to fix the Calgary net. Poll: What Do The Flames Do With James Neal? The Calgary Flames were unable to slow down the Colorado Avalanche last night, and it meant the end of their 2018-19 season. The team with the best record in the Western Conference were knocked out of the playoffs in five games, joining the Tampa Bay Lightning as top seeds knocked out in the first round. Plenty of the blame for the series loss can be laid at the feet of the forwards, who were able to record just eight goals in five games. Johnny Gaudreau’s one-assist performance may be the talk of the town, but there is another huge situation to deal with for the Flames this offseason. That would be James Neal, who was a healthy scratch in game five after failing to register a point in the first four while being a -3. Neal had an incredibly bad debut season in Calgary, registering just seven goals and 19 points through 63 regular season games. The amazing part is that coming into this year Neal was one of the few NHLers in history to record at least 20 goals through each of his first ten seasons, a stretch that showed off his incredible consistency. No, he likely wasn’t going to repeat the 40-goal campaign he had in Pittsburgh in 2011-12, but one could reasonably expect 20 goals and 40 points from the veteran forward. Instead, he dealt with that failure that had him out of the lineup for a game in which Calgary faced elimination. Now the decision is a difficult one for the Calgary management group. Less than a year ago they committed $28.75MM to Neal over a five-year term, a contract that is evenly distributed throughout and includes no signing bonuses. Because of that structure, the notion of a buyout must immediately comes to the forefront of any discussion of Neal’s future. If the Flames were to buy him out it would cost them more than $15MM in actual dollars, but impose just a $1.92MM cap hit on their books. Unfortunately that cap hit would extend through the 2026-27 season, making him quite an expensive mistake for one failure-riddled season. There is also the trade route, given that the contract includes no protection in that manner. But who would be willing to take on such a large salary for a player who struggled so mightily this season? If the team were willing to retain some salary perhaps, but at that point a buyout may seem more reasonable given that they wouldn’t be expecting much in return. Lastly, there is the idea of hoping he can turn it around. Quite notably, Neal has been one of the most consistent shooters in the league over his decade prior to joining the Flames. His shooting percentage had never gone above 14.0% in a single (non-lockout-shortened) season, while never dropping below 10.4%. This season, that number dropped dramatically to just 5.0%. Whether that was a symptom of a declining game, weaker linemates or different deployment, there is a reasonable argument to be made that with a little more luck things might have not looked so rough. The Flames meanwhile have some financial troubles heading their way given the long-term commitments they’ve handed out. The team already has nearly $70MM penciled in for next season, even without the big raise that is coming for Matthew Tkachuk and new contracts for others like Sam Bennett and Andrew Mangiapane. They also don’t currently have a goaltender lined up, as both Mike Smith (UFA) and David Rittich (RFA) are heading to free agency. Getting out from Neal’s contract somehow might be a necessary move for GM Brad Treliving this summer. So what should Calgary do? Do they hold on and hope that 2018-19 was a fluke, and that Neal will be back stronger than ever next season to help them get back to the playoffs? Or do they move on through a buyout or trade in order to open up some cap space, and hope that he doesn’t find his goal scoring touch somewhere else? Vote below and leave your thoughts in the comments. Just one day after being eliminated from the postseason, the Flames have started their offseason work, announcing the signing of center Martin Pospisil to a three-year, entry-level contract. Financial terms of the deal were not disclosed. The 19-year-old was Calgary’s highest draft pick (105th overall) back in 2018 following his rookie season with Sioux City of the USHL where he led the league in penalty minutes with 253, 77 more than the second place finisher. Pospisil’s second season with Musketeers was much more fruitful offensively as he finished second on the team in scoring with 63 points (16-47-63), good for a tie for eighth league-wide. That ranking could have been higher had he not had to serve a 12-game suspension. Pospisil had initially committed to St. Lawrence University back in 2017 but back in November, Mike McMahon of the College Hockey News reported (Twitter link) that the process to clear him to play there hit a snag. Instead of trying to find another school to potentially try to play for, it appears he’ll kick off his professional career next season with Stockton of the AHL. The NHL has announced the three finalists to be this year’s recipient of the Lady Byng Trophy, which is awarded to the player “who best combines sportsmanship and a high standard of playing ability. The Florida Panthers’ Aleksander Barkov, the Calgary Flames’ Sean Monahan, and the St. Louis Blues’ Ryan O’Reilly are up for the title this year. The Lady Byng is a divisive award; some appreciate the intent behind the trophy while others criticize the criteria used to determine its contenders. The Lady Byng is notoriously hard to win for defensemen and has never been won by a goalie, which begs the question of why players at those positions cannot display elite sportsmanship. The award has more or less been whittled down to a measure of penalty minutes versus ice time and production for forwards, whether that is the fair determination or not. By that standard, the three finalists are strong selections. O’Reilly is a previous winner, taking home the trophy in 2013-14, was a finalist last year, and has received votes in seven of the past eight seasons. O’Reilly, who is also a Selke Trophy finalist, is an elite defensive forward, but served just 12 minutes in the penalty box this season through all 82 regular season games. It is his eighth straight season of 12 PIM or less. Barkov, also a strong two-way player, is a Lady Byng finalist for the second straight year and registered a career-low eight penalty minutes on the year while leading all Panthers forwards in points and ice time. Monahan comes in at 12 PIM of his own to go along with a strong season in all three zones as the first-line center for the Western Conference’s top seed. The winner could be any of these three. NHL.com’s Andrew Eide relays news out of Seattle that the refurbished Seattle Center Arena is set to be open by June of 2021. The Seattle expansion franchise ownership group is hard at work rebuilding the former Key Arena, but today have revealed the first timeline of when the facility may be open to the public. While Seattle will not begin play until later on that year at the start of the 2021-22 season, the early accessibility could open some interesting doors to the NHL. Eide writes that the league could consider hosting the Expansion Draft itself or even the NHL Entry Draft at the new home of Seattle’s team if the building is indeed up and running by the expected date. The project is still in the “demolition phase”, as all but the roof of the building is being torn apart and rebuilt, so it’s still too early to know whether the timeline will allow for any league events in the summer prior to Seattle’s inaugural season, but such a possibility would be an exciting start for the new team and fan base. Speaking of arenas, Luke DeCock of the Raleigh News & Observer reports that the Carolina Hurricanes listed an attendance of 19,202 for Game Four of their first round series with the Washington Capitals. That mark is a new franchise high for the Hurricanes, who have seen a re-surge-ence in their fan base this season. Both Carolina’s play and their fan interaction have reignited local interest, which is great news for the team and area hockey. The Canes are just two years removed from ranking dead last in the NHL in attendance with 11,776 on average. While they only ranked 28th of 31 this year, their average attendance was up over 20% from 2016-17 to 14,322. Their attendance on Thursday night, if compared with averages around the league, would have ranked fifth, just behind Toronto and ahead of the likes of Detroit and Minnesota. Hockey is alive and well in Carolina right now and hopefully that continues. The Capitals have swapped third-string goalies, as is common during the playoffs. Vitek Vanecek is on his way to Washington to be the emergency option for Game Three, while Ilya Samsonov returns to AHL Hershey after serving in that role for Game Two yesterday. The Bears are also playoff-bound, so this will be a balancing act for Washington moving forward. The Lightning are dealing with injury concerns for both Victor Hedman and Anton Stralman, so it is not much of a surprise that they have recalled another depth option on the blue line. Cameron Gaunce has joined the team on the road in Columbus and while he looks like insurance only right now, that could change, especially if another Tampa defenseman goes down. According to the AHL transactions page, the Calgary Flames have returned Dillon Dube to the Stockton Heat in the AHL. It’s likely that Dube will suit up for Stockton’s final regular season game and then will likely be recalled to serve on Calgary’s taxi-squad for the rest of the season. The Boston Bruins announced they have recalled defenseman Jakub Zboril from the Providence Bruins of the AHL as a precaution, especially with the status of defenseman Torey Krug up in the air. A 2015 first-rounder, Zboril scored four goals and 19 points in Providence over 56 games and has appeared in two games for Boston.